Little Texas is an American country music band founded in Nashville, Tennessee, in 1988 by Tim Rushlow (lead vocals, rhythm guitar), Brady Seals (lead vocals, background vocals, keyboards), Del Gray (drums), Porter Howell (lead guitar), Dwayne O'Brien (rhythm guitar, background vocals), and Duane Propes (bass guitar, background vocals). Signed to Warner Bros. Records in 1991, Little Texas released its debut album First Time For Everything that year. The album's lead off single, "Some Guys Have All the Love", reached a peak of #8 on the Billboard Hot Country Singles & Tracks charts. Little Texas continued to produce hit singles throughout the mid-1990s, including the Number One single "My Love" and six more Top Ten hits. Their debut album earned a gold certification, while 1993's Big Time was certified double platinum and 1994's Kick a Little was certified platinum. Seals departed in late 1994 for a solo career, with Jeff Huskins succeeding him on keyboards. After a gold-certified Greatest Hits package and an unsuccessful self-titled fourth studio album, the group disbanded in 1997 and Rushlow also became a solo singer. 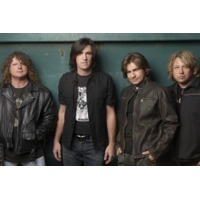 By 2004, the four remaining original members — Gray, Howell, O'Brien, and Propes, along with new lead vocalist Steven Troy — re-established the group, although Howell took over on lead vocals after Troy's departure. Under the four-piece lineup of Gray, Howell, O'Brien and Propes, the band has recorded two albums for Montage Music Group: The Very Best of Little Texas: Live and Loud and Missing Years.